In the sixties, calypso and steelband music became very popular and indeed replaced lapo kabwit and chanté mas as the music of carnival, particularly in the capital Roseau. Many of the traditional songs were performed in the new calypso beat. 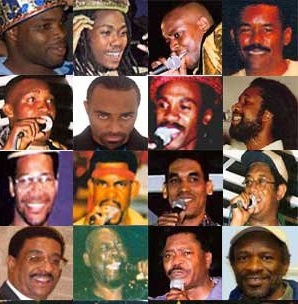 Calypsonians and calypso monarch competitions emerged and became extremely popular. Steelbands emerged all around the country. The older musicians and bands had moved on and were replaced by the younger musicians. Bands such as Swinging Stars, The Gaylords, De Boys an Dem, Los Caballeros and Swinging Busters surfaced and began to cut records. The emergence of radio, first WIDBS and later Radio Dominica helped to spread the music. Calypso has been popular in Dominica since the 1950s; the first Calypso King was crowned in 1959. Popular calypso in Dominica has always been closely associated with steelpan music. The first wave of Dominican steelpan includes bands like Esso, Shell and Regent, Vauxhall and Old Oak. Dominica Calypso Fans & Lovers Lost Another Veteran. Copyright © 2019 Dominica Calypso – Calypso History. All Rights Reserved.